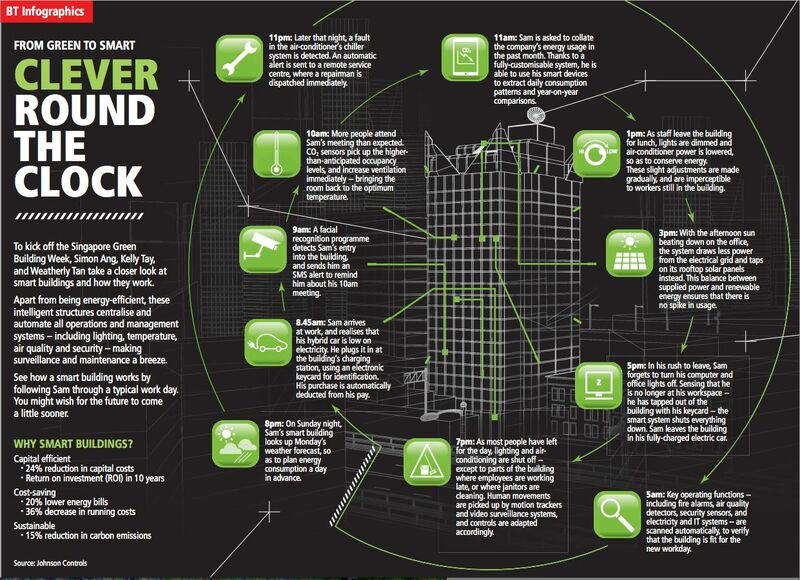 To kick-off Green Building Week in Singapore, the team at the Business Times of Singapore and Johnson Controls are sharing this infographic. It’s futuristic…but not too far off. It is ambitious in its whole-building presentation, encouraging people to think about how all this new technology – Internet of Things , electric cars, renewable energy – will come together in buildings. More visualizations like this are appearing. Emphasis on car charging is well timed, as this week also saw the announcement of Nevada winning Tesla Motors battery factory. I think this is missing one very important component; people. Sustainability has three legs (environmental, economic and social). and I find this vision to be completely impersonal and antisocial. I don’t want to be logged in by facial recognition or monitored by video surveillance as part of my business day. Good points. People have natural aversion to any threat of surveillance. Facial recognition is more invasive than just occupancy sensors. Swiping an ID card is just not a big inconvenience and it leaves the employee some control. Same true in home thermostats? If you don’t live in a huge house, manually adjusting dial is not that difficult, particularly if there is a hint of worry that machine-learning thermostat will start spying.